Ardagh Group announced the commercialization of its metal beverage division’s latest innovation, the Nitro Can. The Nitro Can packaging solution waslaunched in late 2016 to capitalize on the nitro coffee trend gaining momentum in key European markets. Few years ago, nitro coffee was limited to coffee shops, cafes, but now it can be consumed anytime and anywhere thanks to Nitro can’s ability to replicate the effect of traditional stout faucet. Ardagh claims that the can is unique with a fixed, nitrogen-infused widget which delivers a distinct sound when activated. The nitrogen, in-turn adds to the coffee’s aroma and generates and cascading pour that tops off the beverage with a creamy, frothy head. At the upcoming London Coffee Festival, two brands, Minor Figures and Frank and Earnest will showcase their cold-brewed, nitro-optimised coffee in the specialty can. Ardagh Metal Beverage product manager Adriana Escobar said: “The Nitro can is an exceptional packaging format which delivers an unrivalled, multi-sensory consumer experience. “The acoustics associated with its opening coupled with the effect when the beverage is poured makes this a compelling addition the product portfolios of such premium brands as Minor Figures and Frank and Earnest. Minor Figures will be launched its canned product at the London festival. Considered to be one of cold-brew’s biggest innovators, the brand has to its credit several ‘firsts’ in the European market. Minor Figures will debut its Straight Black cold brew in Ardagh Nitro Can. 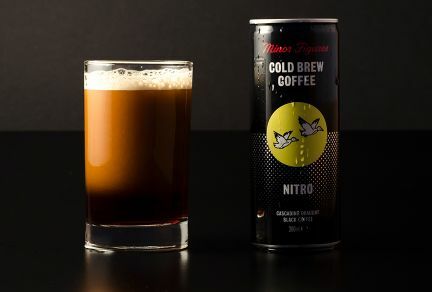 Minor Figures founder and director Stuart Forsyth said: “Nitro cold brew coffee on tap is the latest coffee trend in coffee shops across the UK and beyond. Frank and Earnest, on the other hand will showcase its own cold brew at the London festival. Frank and Earnest co-founder Ben Lion said: “We have spent a lot of time developing the canned version of our Nitro cold-brew to ensure we offer a genuine shelf-stable, great tasting and looking product. This is one of the reasons why we partnered with Ardagh." Image: Ardagh starts commercialisation of nitro can. Photo: Courtesy of Ardagh Group.